I have always taken my dreams (while sleeping) very seriously, it seems that there is another life in our subconscious mind interlinking with the other side. Many times I end up relating real life instances with the dreams I saw. I am going to tell you a very unusual dream I saw way back which somehow got true in reality, not the entire dream but a very small part of it, in an altered way. Once I saw, that I am at my home town with my siblings, playing cricket at the front of our house as usual. While we were playing, all of a sudden there come so many monkeys and start attacking on everyone. Since the attack was so instant we didn’t get a chance to hide and they were also everywhere. In order to protect ourselves we start fighting against them. Gappu, my cousin, 1 year elder than I, he is taller than everyone in our families, starts kicking the monkeys and on a result of which they go up in the sky and while coming towards the earth, it felt as they were flying. The dream ended there. When I got up in the morning, I thought about the dream and forgot a little later. Obviously the monkey attack can be possible but in reality no one can kick them as hard as they go up in the sky. 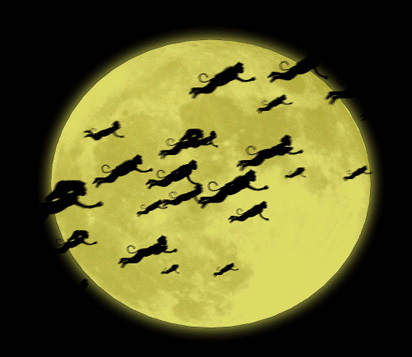 A day or two later, when I was completely out of the ‘flying monkeys’ dream, I was at the roof top of our house, walking and chatting with my siblings, there was some kind of festival that day, kids were flying kites and balloons. Then all of a sudden I saw the monkey shaped balloons in the sky. It was very weird because I never saw any balloon of that shape ever before and that way amazingly the dream turned true. 🙂 Dreams do come true, my friend! It’s no monkey business, lol… for want of a better expression. I enjoy sharing in your dreams. I’ve always been fascinated by my dreams too. LOL, if only we could dictate our dreams, I wonder how much more stupid they would be! You recount them quite well.